House dating from 1850, built under the reign of Napoleon III. This large and beautiful battisse can accommodate up to 17 people (children included). Tastefully decorated in an old but comfortable. Ideally located in a large plot of a hectare park with a large swimming pool Private, a private tennis court, sauna. Parking, closed and Safe in the park, which can accommodate 3 to 4 cars (depending on vehicle size). It is important to indicate that during the week of July 27, 2019 until August 4 included, there will be like every year a Festival Music, Equestrian and Toromachic very folkloric but which can disrupt the calm of this village and the House .. .
NTB: the day of arrival, it will be asked to pay in cash the cleaning fee of 285 euros per week. 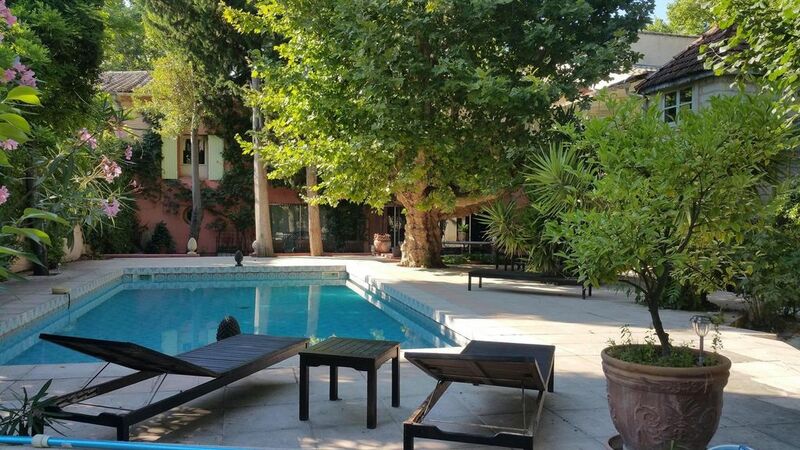 Ideal location, in a beautiful wooded park (about one hectare) with a large pool, sauna, large tennis court, ample parking ... Next to many shops (supermarket, bakery, pharmacy, market / 1 time / per week) .. Attention, against the pool is not secure ... No security barrier, however equipped with an alarm. The owner declines all responsibilities in the event of an accident. Small pool 1M50 and large pool 3M50 deep. This house is strongly discouraged for children who can not swim. Secure, closed parking in the park, accommodating between 3 and 4 cars. Two bicycles, a ping pong table and a table football are available to guests. Important booking conditions: the day of arrival, it will be asked to pay in cash the cleaning fee of 285 euros per week. Deposit for possible damages required 1500 euros: Check (for French people) or cash. Cette magnifique propriété, avec un patio et un grand parc autour d'une piscine et d'un tennis, offre un cadre idyllique pour passer des vacances en famille. Merci pour l'accueil de Sophie. der herrliche Park, unbeschreiblich. Die Lage ist Super und Alles sehr gut zu Fuss zu erreichen. (Einkaufsmöglichkeiten) Das Haus liegt sehr zentral. Auch ist die Gegend sehr ruhig. Jeder von Uns würde sofort wieder buchen. Auch sollte man die Freundlichkeit und Hilfsbereitschaft, von den Hausangestellten erwähnen." (Text automatically translated) Very easy access from highways and airports ... stations nearby.